Microsoft Dynamics SL is a complete enterprise resource planning (ERP) solution for small to medium-sized businesses. Dynamics SL 2018 adds new customer requested features and offers enhancements to the core application and platform. It introduces the Dynamics SL community to Microsoft technologies that can positively impact the way they do business. Optimized Financials – The core financial solution in Microsoft Dynamics SL has been further enhanced. Features for Accounts Receivable, General Ledger, and Accounts Payable are being streamlined in order to optimize data entry and reporting. For example, the need for zero check processing has been removed. Project – Expanding on the depth and breadth of its project solution, new time related enhancements have been introduced. They will assist with time entry week definitions by giving you enhanced abilities to enforce project-related end dates. You’ll have new ways to view invoices prior to approval and have expanded remote access through Web Apps. Vendor Inactive Status – If the vendor status is inactive, the vendor can’t be selected in a new transaction document or on a Maintenance screen. The vendor will remain unavailable until the vendor status is changed back to Active or One Time. Voucher and adjustment entry approval – The new voucher and adjustment entry screen supports segregating data duties for data entry and data review. Now, one user can enter the data and a different user can review, edit, and approve the data. Other enhancements have been added to assist with the entry and approval process. Journal Transaction – Correct Journal Transactions – A new feature has been added to the Correct Journal Transaction screen for reversing, correcting, and copying entries accessed through the Correct Journal Transaction screen. The project related unit values are now set correctly by the reversal process. Flexible billings invoice printing – Support has been added for storing Preliminary and Final invoices to DocShare (Sharepoint) sites or network locations. Users now have a way to share copies of the invoices with colleagues for review. Printed invoice locations are stored to allow viewing of invoice documents. Expense attachment enabling for review – You can now add and view attachments (generally ecopies of expense receipts) using the Project Expense entry screens. Missing receipts can now be attached to process expense reports. Time and expense set up tab rename – The tab displays Web Apps Time for settings instead of the Project Flex Time (PFT) set up tab. Power apps and flow – Microsoft technologies, Microsoft Power Apps & Flow give customers functionality that can interact or report on their Microsoft Dynamics SL Data and other business data. The Power App has been updated and nine new flow email notifications have been added. SL Home Page Enhancement – Updates have been made to the Microsoft Dynamics SL Menu Home Page to support modern webpages. Web sites that have information on SharePoint, SSRS reports, SL DocShare, and other sites will display and allow interactions within the Dynamics SL menu system. Homepage copy to user/group list feature – A Home Page web page value can be copied to one or multiple users or groups eliminating the need to manually copy Home Page values for each user or group. Dynamics SL data in the Intelligent Cloud – Customers can start taking advantage of viewing their data in the cloud. Using the Intelligent Cloud set up, you can replicate financial data to Microsoft Dynamics D365 Business Central (BC) solution. Company data can be viewed on a smart phone, tablet, or PC through D365 BC. Platform Updates – Transport Layer Security (TLS) provides communication security over a network. TLS 1.2 which provides the level of security required by many companies is now supported. Microsoft SQL DB Encryption is now supported in Dynamics SL 2018. Easier Innovation is possible when you use one connected app platform. Power BI – You can connect to hundreds of data sources using Power BI, a suite of analytics tools. Beautiful reports can be created and published for consumption on the web and mobile devices. Users can create personalized dashboards with unique 360-degree views of their business. SL Power BI Content Pack – A new Dynamics SL Power BI content pack will give you the ability to connect and build reports using your SL project data. Three Power BI dashboards are available. OData Services – A consistent connection to Microsoft Dynamics SL data will be provided using OData services. They will be used to create installable packages to deliver Power BI reports to Dynamics SL customers. Microsoft Power Apps – Used for creating custom business apps across platforms. Apps can be built quickly using a point and click approach without writing code. Your app can be connected to data you’re already using. You can use Excel like expressions to add logic easily. Your app can be published to the web, iOS, Android, and Windows 10. Microsoft Flow – Provides a way to create automatic workflows between your favorite apps and services. Users can get notifications, collect data, synchronize files, and more. Microsoft Power Apps and Flow for Microsoft Dynamics SL – Built to connect to Microsoft Dynamics SL data, initial Power Apps include: Viewing Customer Receivables Due, View and interact with customer information, Run the Customer Aging Process to update balances, and Automated Email of Aging Results to view. New interactivity has been provided to the end-user. Enhanced query and preview – Reporting enhancements have been expanded, bringing static reporting and querying together to provide better insight and preparedness. An interactive view into your Microsoft Dynamics SL data is provided through quick queries. Approvals – Security features widely cover companies’ requirements for separation of duties. Expanding on that need, a new approval process will require data entry to be approved prior to processing. Web Apps – Used to provide browser-based access for viewing data on a smart phone, tablet, or desktop, web apps allow remote access for Project, Time and Expense, Resource Planning, Requisitions, Financials, Reporting, and Quick Query. Three new web applications have been created for Microsoft Dynamics SL 2018: Timesheet Status, Project Change Order, and Project Charge Entry. 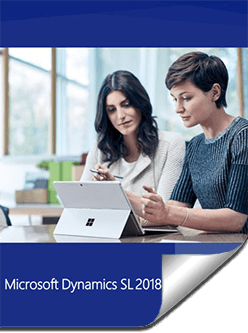 Explore Microsoft Dynamics SL 2018 CU1 in greater detail in this downloadable whitepaper. Explore Microsoft Dynamics SL 2018’s new features and enhancements in greater detail in this downloadable whitepaper. 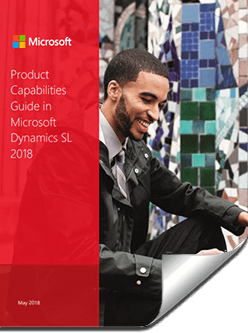 Explore Microsoft Dynamics SL 2018 in greater detail in this downloadable whitepaper. Microsoft Dynamics SL 2018 is easy to deploy and integrate with your current technology.